One year after its debut on the NYSE and fewer than two months after completing its $15mm sale of preferred shares, Innovative Industrial Properties (NYSE: IIPR) has filed a preliminary prospectus to raise up to $100mm. The S-3 registration statement indicates that the company may sell common stock, preferred stock, depositary shares, warrants, rights and/or units. With the recently announced pending property acquisition of The Pharm’s 358K sq. ft. facility for $15mm, with $3mm of additional improvements, the company, which is also landlord to Pharmacann in New York, Vireo Health in Minnesota and New York and Holistic Industries in Maryland, needs to raise capital to support further expansion. 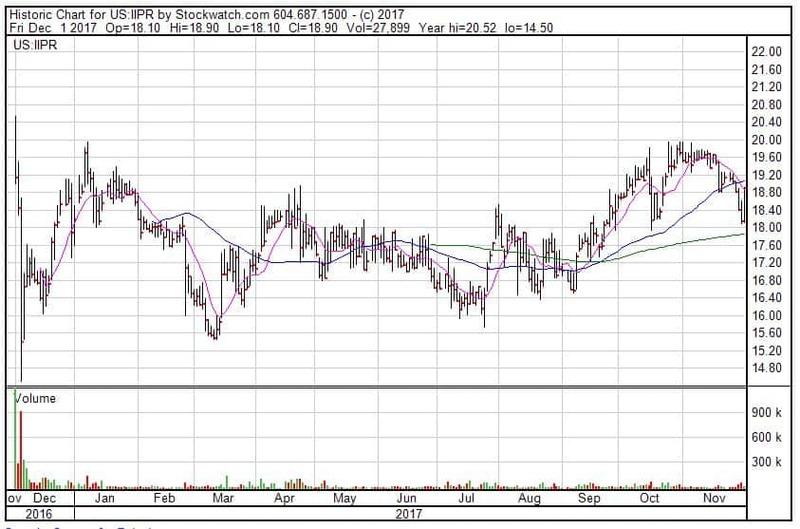 IIPR went public in late November last year at a price of $20, and currently has an NAV of $17.13, based on the balance sheet in its Q3 10-Q, with 3.501mm common shares outstanding. The company pays a quarterly dividend of $0.15 per share, giving it a dividend yield of 3.2% based on the close of $18.90.